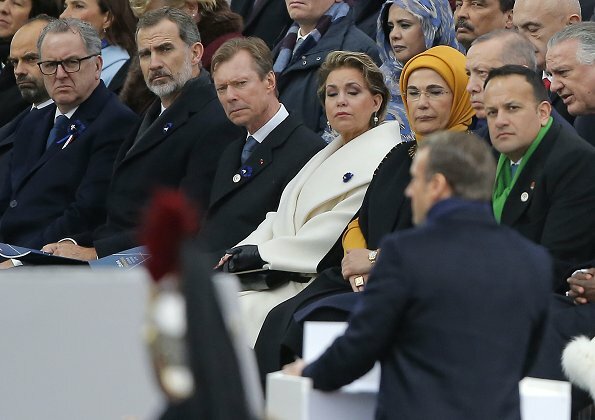 Grand Duke Henri and Grand Duchess Maria Teresa of Luxembourg, Prince Albert II and Princess Charlene of Monaco, King Felipe VI of Spain, King Mohammed VI of Morocco and Prince Moulay Hassan of Morocco attended the commemorative ceremony held in connection with the 100th anniversary of the November 11, 1918 armistice which ended the First World War. 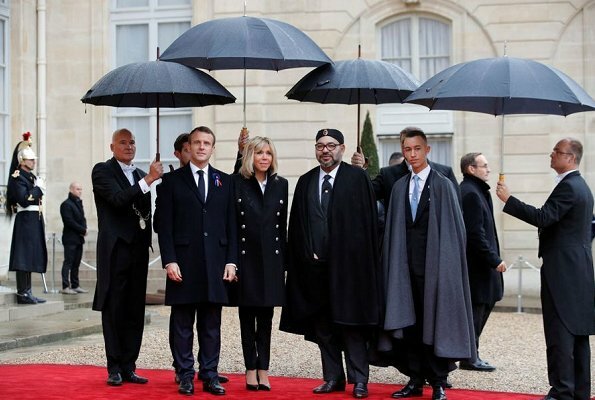 (In Paris, around 70 heads of state, prime ministers and foreign dignitaries and Emmanuel Macron got together at the start of armistice commemorations at the Arc de Triomphe). Charlène est ridicule avec son bavoir . D'accord pour le bavoir. Sa 'fantaisie' est de mauvais gout. Je n'ai jamais aime le style vestimentaire de Charlene, en general excessif ou mal approprie. Mme. Macron, comme toujours, essaye de paraitre plus jeune que son age... Mais a chacun son gout. In my opinion Charlene looks beautiful and elegant. Lovely hairdo. Charlene très classe comme toujours. Sobriété et petite touche de fantaisie. Bravo ! C’est une commémoration pas un défilé de mode ,et elle n’est pas la vedette. J aime beaucoup sa blouse. Charlene rocks today. She looks beautiful and chic. 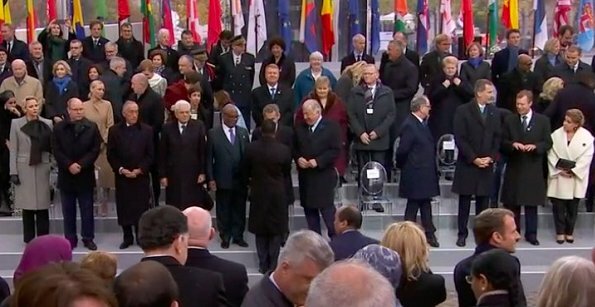 Every spouse of Head of States look great some more then others.But this is not a fashion Show this is a somber meeting of Rememberance . I think for Charlne every event is a fashion event. 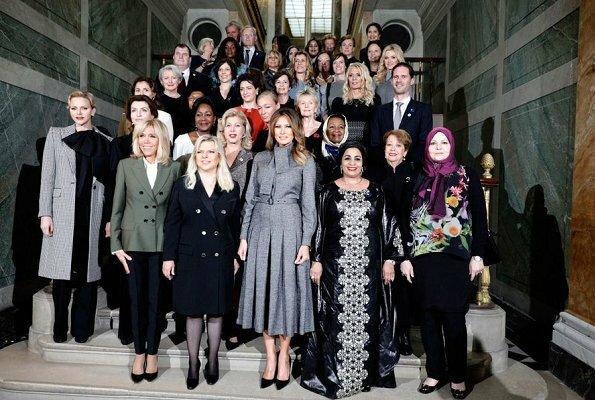 Very chic showing from the royal ladies and political spouses, especially Princess Charlene, Mrs Macron and Mrs Trump. Big no to GD Maria Teresa’s coat and hairstyle, her whole look to be true. Would have liked to see Letizia there today with Felipe. I like the coat MT is wearing, looks warm and cozy, but also classy for this occasion. Pedro Sánchez's wife (Prime Minister) was there, she is acting as the First Lady when the First Lady is Letizia. Mixed feelings about Charlene's bow. And she has been wearing too much black lately! J'adore Charlène et sa tenue est magnifique de sobriété.j'adorerais de la rencontrer... je suis une grande FAN de la famille de MONACO. 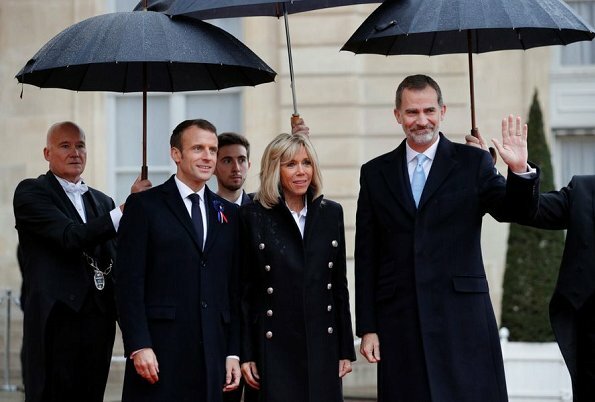 Maria Teresa looks great, Charlene looks very elegant, Madame Macron also good. 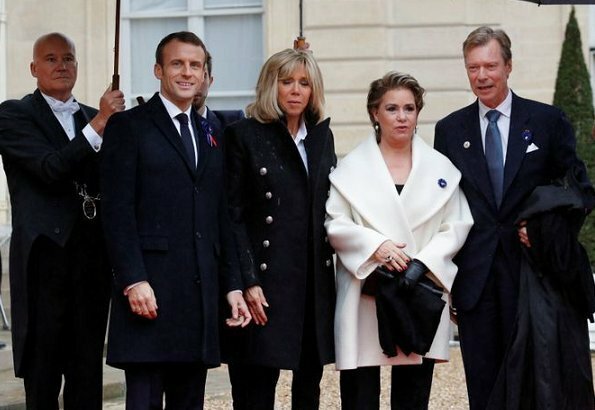 Well i think Maria Teresa made the wrong choice with this coat, the collar is far too big for her and makes the general style too heavy for her. Well i think it suits her perfectly and is very flattering and cosy looking. I don't understand why some people dont think white or cream are acceptable at this event - they are colours of mourning as well. Charlene not only looks appropriate but on point. Why is she being criticized for refusing to dress like she is a 70 year old woman? For those not liking the way she is dressed, how would you suggest that she dress? There are some spouses wearing cultural attire that you may want to pick apart as well. So many complaints about Charlene wearing black! She looks good in black, and the rules about wearing black no longer apply and haven't for a very long time. 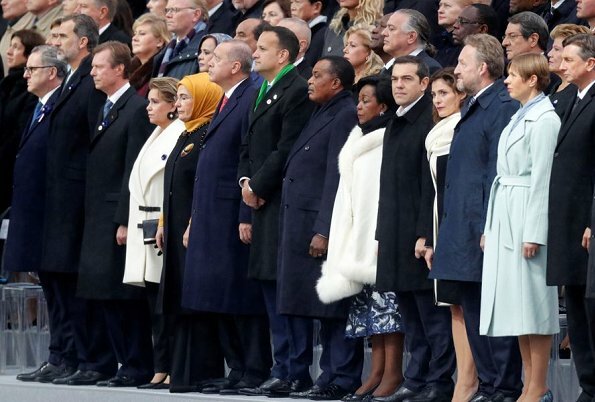 Marie Teresa and the woman in the white fur wrap stand out too much. I am not sure who the other woman is, but MT should have known not to wear white. 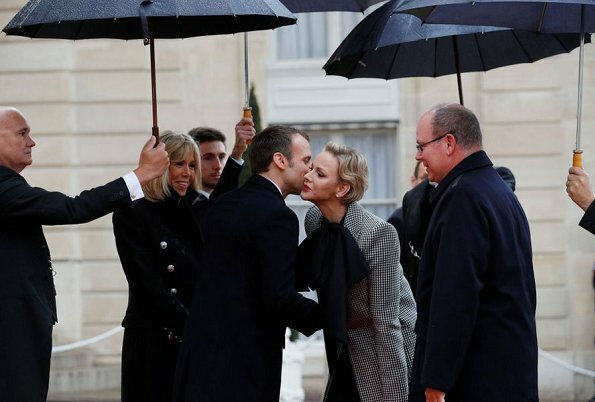 Military style coats like Mrs. Macron's ruled the day. The British are the clear winners...actually QEII's coat, just fab. The ladies here are well turned out, but it is true that MT should have chosen another color. Charlene as a young person can take a risk...no harm done, and she stayed within the color scheme. Just an observation, ...Mrs. Trump's dress seems to be an upgrade of RL's Varela suit worn last week. Princess Charlene is so beautiful. I really love her new hairstyle. It is classic without being boring. She is at times a daring dresser, but it always pays off. I think the black bow could have been slightly smaller, but not by much. It makes an otherwise somber outfit, appropriate for the remembrance ceremony occassion, more striking. 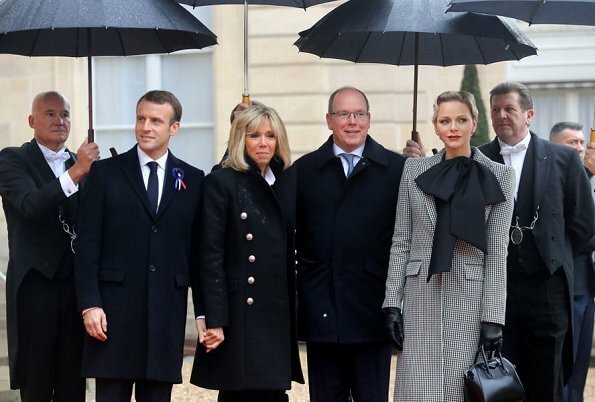 Of all the ladies present, Mrs Macron is the winner to me, especially with her military style coat, giving a nod to the armed forces. The Grand Duchess Maria Teresa's cream coat is unflattering, espcially for a woman of her height. The style and fashion looks great. This get together looks more like a talkfest. Having a relative who was in the Veterinary corp; WW 1. Charlene's large bow for the photo for posterity was a nice choice. If a sudden wind whipped up, people would see how functional Maria Theresa's collar is. The ceremony was the centennial, not the funeral on the third day. White is perfectly acceptable.